SAVING and spending money correctly is very important in order to be financially healthy. Sometimes it’s not just the big things such as paying for your car or house that consume your money, but it is unnoticeable things such as bank charges that are taking up most of your money. Meldah Lishiba, a banker based in Johannesburg, says it is important to open a bank account that meets your needs. “Visit your nearest bank and find out more about the account you have with them. Find out what the charges are and if they charge per transaction or you pay a monthly fee and from there you can choose or switch to an account that best suits you,” she says. Meldah also advises that you shop around different banks to find an account that is best suited for you. Financial advisor, Simonne Swart, says you should honour your debit orders because should they bounce, it is not just the bank that will charge you, but the service provider too. The bank will charge you because the payment bounced and the service provider will also charge you a fee for late payment. “An alarming number of individuals default on their financial obligations or reverse debit orders when strapped for cash,” she says. Living on your credit card is financially unhealthy because it means you are living beyond your means. 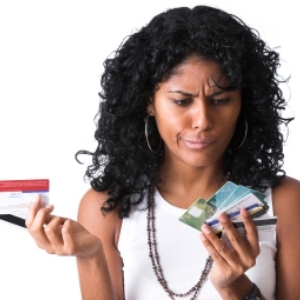 If you are buying essential items on credit, something is very wrong with your budget. Simmone advises that you should understand the difference between needs (essential items) and wants (non-essential items). “A credit card can be addictive when you find yourself swiping as though you have money,” she warns. However, some banks do not charge interest on your credit card if you pay back the money within 55 days of using the money, be smart and use this option if it is available on the credit card you use. “Most clients do not know that they can reduce their credit limit that has been given to them by the bank. For example the bank will say you qualify for a R40 000 credit which can sometimes tempt you to spend more than you need to. Reducing your credit limit helps you not to spend too much on credit,” says Simmone. Many people are guilty of going to the mall to get one thing, but come back with a whole lot more than what they intended to buy. “Make use of a shopping list when you go shopping to avoid buying unnecessary things and forgetting to buy what you are there to buy,” says Simmone. She also suggests that you do not go to the mall for just one item. “I keep a list of things that I need on my fridge. If there are less than 10 items on the list then I am not going to the store. I will only go if there are 10 items or more. This truly teaches you discipline,” she says. Simmone says most clothing accounts charge high interest rates and recommend a minimum instalment that only pays off interest fees and a tiny portion of the actual balance owed. This means you end up taking years to pay for something you could have bought by saving for it in a few months. “Most people pay club fees for a club magazine that they seldom read and discounts that they rarely use,” says Simmone. Some accounts are six months interest free, which means if you pay your debt back in that period you will not be charged interest, this is something to consider if you feel you need a clothing account. With some other accounts the service provider will charge you interest upfront after your purchase and will not generate interest thereafter. Simmone says the biggest challenge with clothing accounts and any form of credit is that you begin to believe that you have extra cash to spend when you don’t. Once you buy something on credit, you are obliged to pay that monthly instalment whether you like it or not. If you don’t, most creditors will relentlessly hunt you down until you are blacklisted and your credit profile is ruined for years. Simmone says renting and buying have benefits and shortfalls. “Buying a house could be one man’s cup of tea while renting would suit the lifestyle needs of another,” she says. ¦ You are looking for long-term security, ownership and potential growth in personal wealth. ¦ You wish to sell for a potential profit at a much later stage. ¦ You wish to have control over your living space. ¦ You wish to rent it out to generate an income. However, many do not think of the full extent of the consequences of home ownership. ¦ The huge financial responsibility that is “set in stone” for the long term. ¦ Extra costs which are highly underestimated by most first-time home owners such as rates, taxes, regular maintenance and insurance. for most people, a home owner can’t just up and leave once the lease is over like a tenant can. ¦ You do not want to stay in one place for too long. ¦ You have chosen a career path that allows for the opportunity of regular job relocation. ¦ You want to live in an area where you may not otherwise be able to afford to buy. ¦ You want to save on insurance and minimise extra costs. A tenant only needs to cover home contents since they are not responsible for the maintenance of the property and possibly, electricity and water, if not already included in the rent. According to Simmone, renting has its shortfalls, such as restrictions of lease agreement and rules set out by the landlord. Simmone highly suggests that you need to be honest with yourself about how much you can afford. She also suggests that you have at least six months of rent or bond instalments saved up before starting the process of renting or purchasing a property. Removing tax credits for medical schemes will make them unaffordable to 22% of current scheme holders, affecting poorer members most. Analysts and experts have urged citizens to live within their means and to avoid new credit, as it might come with higher interest rates.